CHICAGO – Police are searching for the people responsible for luring a 9-year-old boy into an alley and executing him who thought the boy shouted a warning to rival gang members. Chicago Police Superintendent Garry McCarthy said, the child was targeted because his father was a member of a gang that was in conflict with another gang. “Tyshawn Lee was murdered in the most abhorrent, cowardly, unfathomable crime that I’ve witnessed in 35 years of policing,” Chicago Police Superintendent Garry McCarthy told reporters. This year alone, police say, more than 830 people in Chicago have been killed — and 6,100 have been shot. The Auburn-Gresham neighborhood, where Tyshawn was shot to death, gangs battle over turf and the right to sell drugs on a particular city block. 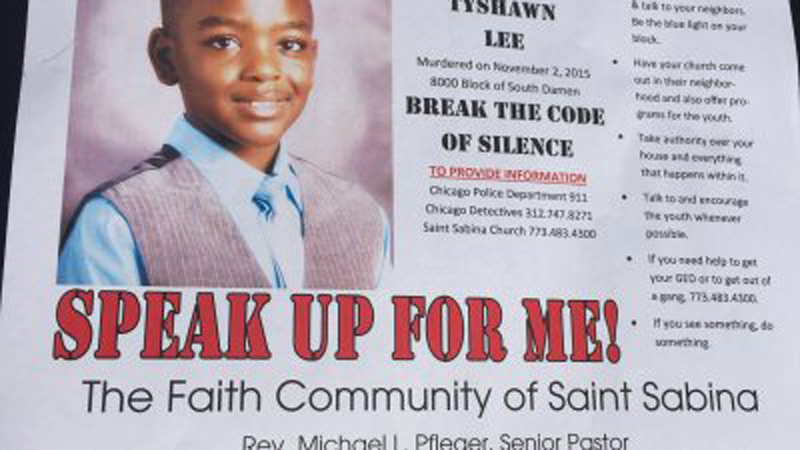 Tyshawn was shot multiple time in the face and the back, his funeral was held St. Sabrina Church.